← Stow, Ohio. April 17th, 2011. Woodland, California. April 18th, 2011. 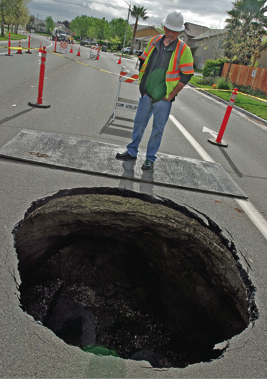 Public Works crews are fixing a 15-foot-wide sinkhole next to Pioneer Park in eastern Woodland. The hole, located at the corner of Branigan Avenue and Fredericks Street, was first reported late Saturday when it was small enough to cover with a construction cone – not large enough for the department to schedule repairs, Woodland Infrastructure Superintendent Tim Lloyd said. By Sunday it had grown to take up almost two-thirds of the lane, forcing the department to redirect traffic. Officials are still uncertain what caused the hole but they have a theory, Lloyd said. About 16 feet below the ground, they think an eight-inch water pipe broke. Above that, at some 12 feet below ground level, is where the water table lies. The groundwater may be flowing into the broken pipe and carrying earth with it, taking away the asphalt’s support, he said. As of Monday morning the hole appeared to have stabilized but officials are expected to widen it so they can drain it and check the pipe. It was not immediately clear when Branigan Avenue will reopen. This entry was posted in Pictures and tagged California, sinkhole, water main, Woodland. Bookmark the permalink.